▲ Figure 1: Scheme of scattered light waves inside an inhomogeneous and opaque environment. IBS scientists are able to focus on the scattered waves that have interacted with the target and maximize their intensity. A body’s complex environment inhibits most of the light waves from reaching the target (green waves), whereas information about the target is presented in the red and blue waves. As target depth increases, the single-scattered signal (red) becomes negligibly small, because it is more likely that the waves will get bounced around by other biological molecules in their path (blue). Therefore, the goal of this study was to selectively control and enhance the blue waves over the green ones. ▲ Figure 2: Selecting the right waves. a) The goal of this study is to enhance the intensity of wave (3) over (1), (2) and (4), as (3) is the only wave which hit the target and thus contains information about it. b) IBS scientists took advantage of the different times it takes for the waves to be refracted back. Thanks to this technique, the wave which hits the target (wave 3) can stand out from the other waves. The final images show simulations with untargeted light signals (c) or targeted waves, equivalent to wave 3 (d). Compared to c), the waves in d) are less diffused laterally and reduce their intensity with increasing depth. ▲ Figure 3: Peering through the skull. 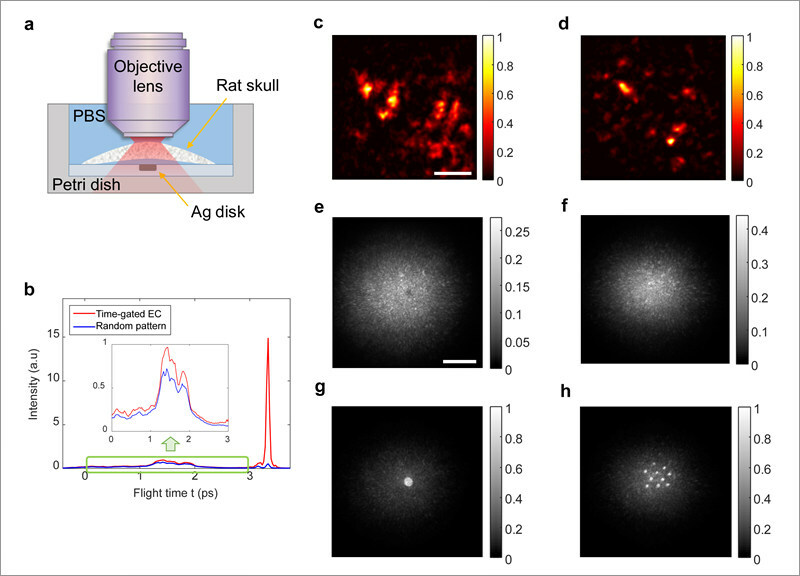 a) Either one or ten silver disks of 10 and 3 μm diameter, respectively, were placed below an approximately 340 μm-thick mouse skull and immersed in serum (PBS). b) The intensity of returning waves increased at a travel time of 3.2 picoseconds. 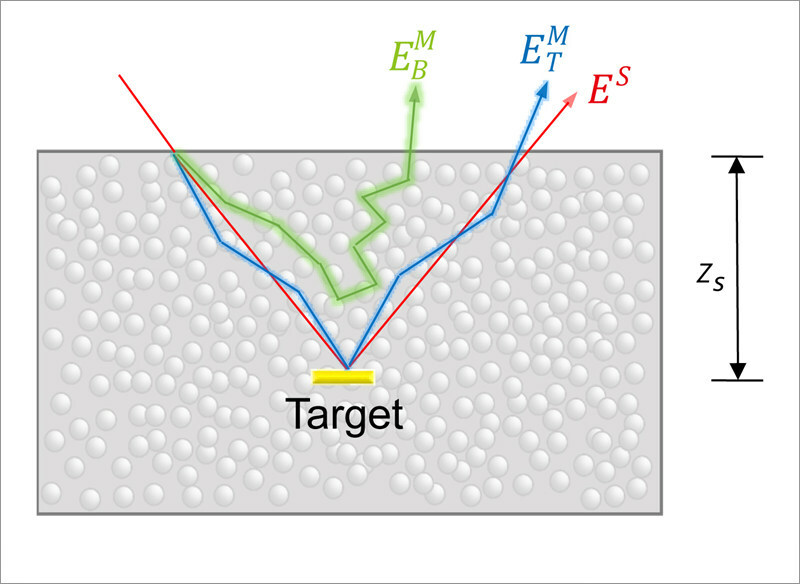 c-d) Both targets were completely invisible to the collective accumulation of single scattering (CASS) optical imaging technique. 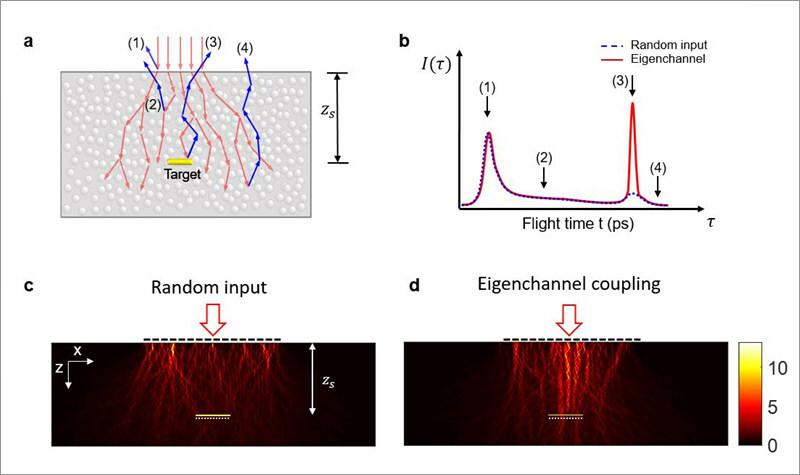 e-f) Images of the transmitted waves using untargeted light signals, and g-h) images obtained with this new technique focusing on waves with travel time of 3.2 picoseconds. “Optical imaging can generally work at the depth of 1 transport mean free path; roughly 1 mm of biological tissue. Our technique goes deeper into tissue, at nearly twice the depth,” details Seungwon Jeong.